The pump don't work 'cause the vandals took the handles. SEVENTEEN YEARS after the last major sighting of locusts on the eastern seaboard of the United States, seventeen years after the last attempt at a right-wing coup d’extorsion on Capitol Hill, the Republicans of the House of Representatives have swarmed the machinery of American government, forcing the shutdown of the world’s brightest constitutional democracy and pre-eminent economic power, because that party couldn’t extort concessions from a Democratic president with the stones to tell them the United States wouldn’t be held hostage to terrorists of the congressional kind. 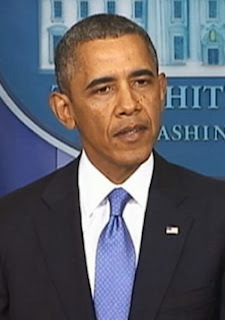 After a day of furious ping-pong between the House and the United States Senate — exchanging the same continuing resolution to fund the U.S. government, with amendments by the Republican House stripped out by the Democratic Senate — the House Republicans were forced to accept the fact that President Obama wouldn’t blink on any language in the bill that changed, compromised or chipped away at the integrity of the Affordable Care Act. Including its start date, Tuesday, Oct. 1. 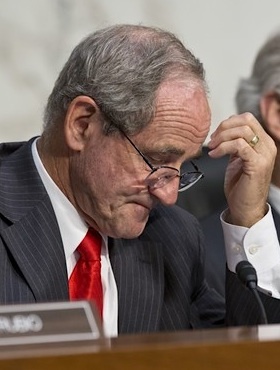 Like the deeply cynical strategy employed during the Vietnam War — when one U.S. officer told Peter Arnett it was necessary to destroy a town in order to save it — the House Republicans have decided on a scorched-earth policy that threatens Americans across the board. Effective as of 12:01 a.m., East Coast time, about 800,000 federal workers will be furloughed from their jobs. Federal home loans will be suspended. WIC food programs indispensable for young mothers and children, may be endangered. Museums in D.C. are closed. Veterans centers will be shuttered. The Commerce, Energy and Labor Departments are down; so is the Environmental Protection Agency. National monuments will be closed across the country. Those monuments are staffed by members of the National Park Service; they’ll also be furloughed. That’s why national parks will be closed, including Yosemite National Park, celebrating its 123rd anniversary on Tuesday. The same date that the National Aeronautics and Space Administration, another agency to be idled by the shutdown, began its work in 1958. And this domestic pain will resonate uncertainty to the financial markets around the world. The brinksmanship exhibited by the Republicans — forcing Obama and Democrats into what a Current TV commentator once called “playing chicken with nihilists” — is expected to have a big impact on U.S. and global stock markets, could stall the domestic recovery that’s just kicking in and do damage to the world economy as well. In the current scenario, the inmates not only run the asylum of the House of Representatives; they’re threatening to burn down the asylum, and the town and country too. PRESIDENT OBAMA wasn’t bullshittin’ this time. He made that much clear in a brief address to reporters at the White House, hours before the deal went down. “[O]ne faction of one party in one house of Congress in one branch of government doesn’t get to shut down the entire government just to refight the results of an election,” he said. And the strength of the president’s position was shown in the final hours. As the continuing resolution went from its clean condition in the Senate to being larded by the House with a last-minute GOP wish list of add-ons and tweaks, the special requests got more and more unlikely, and more and more indicative of a fishing expedition, an exercise in parliamentary games. There’s evidence that the House Republican Conference was never serious about even trying to head off a government shutdown. Video of House Republicans emerging from a closed-door meeting on Saturday makes it clear. A smiling, high-fiving, thumbs-up ebullience is obvious. The mood of House Republicans, variously characterized in news reports as “giddy” and “ecstatic,” puts the lie to the notion of those lawmakers having a grasp of a government shutdown as a harsh, grimly necessary undertaking — something done reluctantly, with an understanding of the pain it would inflict on ordinary Americans beyond the Beltway. For them, a shutdown was cause for celebration. For them, this was never about governing. It was always about Gotterdammerung. The twilight of Democratic power is something that House Republicans have been planning since at least the 2010 midterm election. 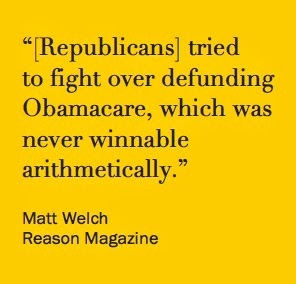 There’s blame enough to go around among those in the Republican leadership. But for first among equals, you gotta go with John Boehner, the ostensible Speaker of the House of Representatives, who refused to introduce the clean funding bill to the full House for a probable passage, and whose tenure in that position gets more and more tragically Shakespearean all the time. Courses of responsible constitutional action couldn’t get much clearer than they were for Boehner over the last few days. 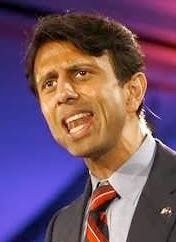 He could reject the blackmail tactics of his caucus and act as the Speaker’s expected to act on behalf of the nation he represents, or he could knuckle under to the Calhounist nullifiers in his party, walk away from the responsibility that comes with being third in line of succession to the presidency, and cement his growing reputation as the most willfully invertebrate, ideologically coercible House Speaker in modern American history. Boehner, who already made Newt Gingrich look like Sam Rayburn by comparison, took the easy way out on Monday. 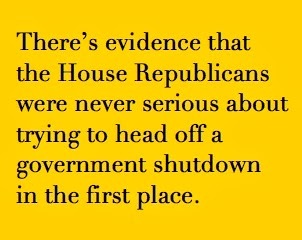 The rest is current events, and the first shutdown of the U.S. government since 1995-96. When Gingrich was speaker. 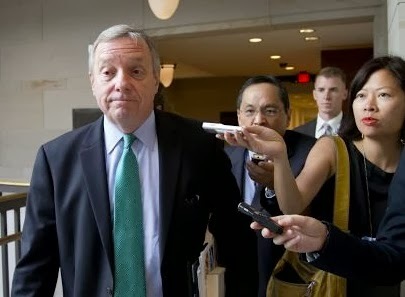 SEN. RICHARD DURBIN of Illinois, a usually circumspect and even amiable presence in the Senate, let Speakerphone Boehner (and the Tea Party faction that has his convictions in a vise) have it in uncharacteristically blunt terms. Before the deadline, Durbin called on Boehner and the GOP to “step up and accept their responsibility to govern, and let it start with the Speaker. I understand his plight. It’s very obvious to the world: He has a willful group within his caucus. On MSNBC’s “All In With Chris Hayes,” Matt Welch of Reason Magazine had one perspective on what this means for the divided Republican identity, what it really got them and where this may be headed. “What did the Republicans give themselves in terms of leverage on this deal, over time?” Welsh asked rhetorically on Monday. THE SENATE left after its last vote of the day and won’t reconvene until 9 or so on Tuesday morning. So much for “a couple of hours.” But the House Republicans’ position is ultimately indefensible, and they know that already; that suggests a resolution to this impasse sooner rather than later. We may find out that the only point to this congressional tantrum, the reason for doing it was to prove to the White House and America that they could. But things may not be that surgical. The in-for-a-penny-in-for-a-pound mentality that got us to this point in the first place won’t have disappeared among the Republican caucus overnight. 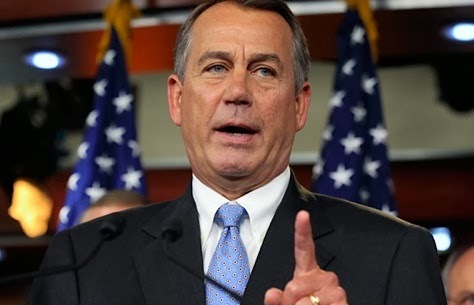 Neither will the very real animosities between Speaker Boehner and President Obama. And neither will the uncertainty, whether it’s seen through a macro lens — Goldman Sachs estimates a government shutdown could cost the United States $8 billion a week — or the micro, up-close, personal lens, the one that reveals the cost of this shutdown to millions of everyday people caught in the undertow of a party more informed, animated and powered by outrage than anything else. Image credits: Boehner: via foxbusiness.com. 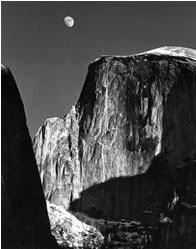 “Moon and Half Dome” (1960) by Ansel Adams/© 2013 Ansel Adams Gallery. Obama: White House via abcnews.com. Durbin: J. Scott Applewhite/Associated Press. DID YOU see Rand Paul’s ad for Polo Ralph Lauren, in the September Vogue magazine? Or was it Brooks Brothers? Or was it an ad at all? 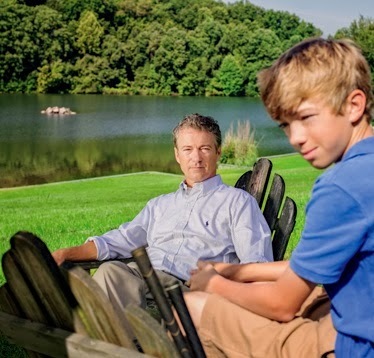 The Kentucky Republican senator was tricked out in elite casual finery for this Adirondack-chairs-in-summer-sunshine photo, an image that accompanied a serious piece of reporting about Paul and his prospects for the presidency in 2016. But while it wasn’t an ad for a product, that photo, with its Kennedyesque echoes of a Simpler Time, may well be Rand Paul’s best advertisement for himself. Paul’s to-the-manor-born optics dovetail with those of the Republican identity, but in recent statements about major domestic issues, in what he would claim to be an evolution, Paul has been tacking to the center, carving out some philosophical space between himself and other Republicans, and certainly between himself and anyone else entertaining the idea of a run for the presidential roses. Take what happened late last week. Paul, who has historically allied himself with anti-Obamacare stalwarts Senators Ted Cruz of Texas and Mike Lee of Utah, put some distance between himself and the Tea Party regulars opposing the Affordable Care Act, after Cruz’s embarrassing soliloquy on the Senate floor. Part of Paul’s response was no less than a concession that Obamacare would withstand any challenge from the GOP. “I'm not sure it's my job to give them advice,” Paul told reporters, including two from The Huffington Post, on Friday. “On party lines, Obamacare will continue. Americans are going to have to judge whether it’s a good thing or a bad thing.” It was a bid for practicality and centrism by default; by dismissing the latest intractable position taken by Cruz and Paul’s fellow Republicans in both chambers, Paul makes a bid to be seen as the adult in the room by doing nothing more than walking away from Cruz’s intransigence. “If I told you that one out of three African-American males is forbidden by law from voting, you might think I was talking about Jim Crow 50 years ago. Yet today, a third of African-American males are still prevented from voting because of the War on Drugs. The War on Drugs has disproportionately affected young black males. “The ACLU reports that blacks are four to five times more likely to be convicted for drug possession although surveys indicate that blacks and whites use drugs at similar rates. The majority of illegal drug users and dealers nationwide are white, but three-fourths of all people in prison for drug offenses are African American or Latino. “Why are the arrest rates so lopsided? Because it is easier to go into urban areas and make arrests than suburban areas. “Arrest statistics matter when applying for federal grants. It doesn't take much imagination to understand that it's easier to round up, arrest and convict poor kids than it is to convict rich kids. “Since mandatory sentencing began, America's prison population has quadrupled, to 2.4 million. America now jails a higher percentage of its citizens than any other country, at the staggering cost of $80 billion a year. On MSNBC’s “The Last Word,” Lawrence O’Donnell called it “the politically bravest thing said in Washington today.” Given the overall climate on Capitol Hill — one of a disinclination for brandishing philosophical courage — that sets a pretty low bar. But O’Donnell said it by way of putting in context Paul’s chances for the White House in 2016. In O’Donnell’s assessment, Paul’s comments in committee Wednesday will be utterly corrosive to efforts to build the conservative base Paul would presumably need to win the nomination; Paul’s comments amount to rank apostasy, a violation of the prime directives of the Republican Party: Thou Shalt Be Loyal. Thou Shalt Hew to the Party Line. But you can look at it through a completely different lens — or the proverbial opposite end of the telescope — and see why Paul’s cri de Coeur matters. The senator’s thoroughly progressive stand on this issue can be seen as what could be the first serious Republican move toward the political center by a credible prospect for the White House in 2016. And with good reason. 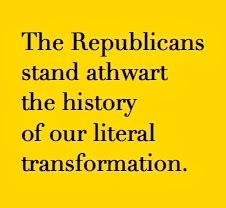 THE REPUBLICAN Party had its head and various other body parts handed to it in 2012. With the standard-bearer of multimillionaire political ventriloquist’s dummy and former Massachusetts governor Mitt Romney, the GOP went down to a crushing defeat. One consequence of that wipeout was that the Republicans found themselves in the unlikely position, for the second time in as many federal election cycles, of walking in the wilderness and contemplating the error of their ways. And implicit in what he said, Paul clearly buys into the idea that Republican outreach to black voters is possible — not just possible but necessary — and that conceding the black vote to the Democrats needn’t be a standing operational rule for the GOP anymore. Labels: Maddow interviews Rand Paul, Rand Paul bolts the herd--maybe, Rand Paul on Civil Rights Act 1964, Rand Paul tacking to the center? AT NOON on Wednesday, Texas Republican Sen. Ted Cruz withdrew the catheters and pulled out the line to his French roast IV drip, signaling the end of his marathon soliloquy, 21 hours and 19 minutes after he rose to speak “in opposition to Obamacare” on the United States Senate floor. 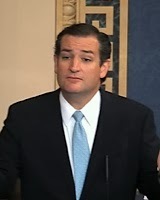 This wasn’t Ted Cruz channeling Jimmy Stewart in “Mr. 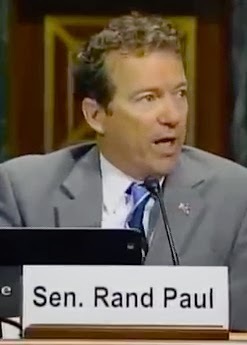 Smith Goes to Washington” (an act of political theater [or theatrics] that Cruz’s fellow senator, Rand Paul of Kentucky, more or less successfully pulled off not so long ago). This was a last-ditch attempt to link defunding of the Act, shorthanded in the culture as Obamacare, with the continued operation of the federal government, with a meaningless expression of his opposition to the Senate voting on the bill. The Senate voted Wednesday, 100-0, to move to debate the continuing resolution that was passed by the House, a measure that would keep the federal government open beyond the end of the fiscal year, Oct. 1. Cruz’s vote was, obviously, one of the 100. The House bill would keep the government lights on through Dec. 15 while defunding the Affordable Care Act. 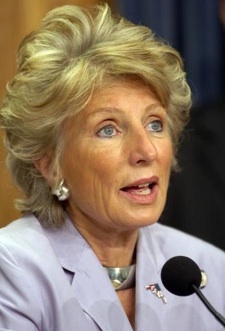 Senate Democrats and Republicans have agreed to end debate over the bill on Friday. Senate Majority Leader Harry Reid is expected to strip that defunding language out with a majority vote. 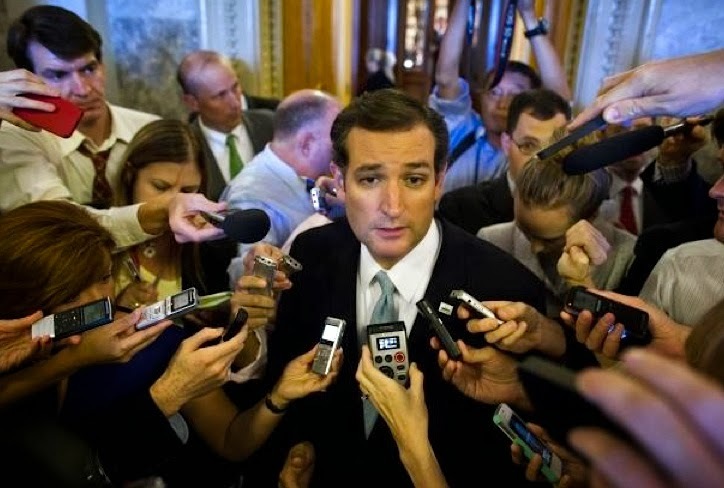 “Washington depends on the American people not paying attention,” Cruz said. He can bet people are paying attention now, but not like he thinks. The freshman senator from Texas can take some solace in knowing that his little stunt — and that’s the only word for it — has a long precedent. Cruz was attempting to exploit the almost reflexive opposition to wide-scale change Americans have shown throughout our history. Cruz, Sen. Mike Lee of Utah and others in the Republican Party have enlisted opinion polls on their behalf; many of those surveys show the American people at least statistically skeptical about Obamacare. But if Cruz and other GOP naysayers, and the poll respondents, weren’t quite so short-sighted, they’d see how the ferocity of the current debate dovetails with other debates earlier in the national experience. In their opposition to Obamacare, the Republicans, like many others in previous American eras, stand athwart the history of our literal transformation. As with other seismic American events, the advent of the Affordable Care Act has engendered the first part of a process a lot like some of Elisabeth Kübler-Ross’ renowned five stages of grief — only with a more favorable expected prognosis for the patient of a nation. FIRST, WE'VE had the denial: the health-care program that goes into effect on Oct. 1 has been roundly rejected by lawmakers and met with skepticism by the public (doubt cultivated by those same lawmakers). What’s followed in recent weeks has been anger and bargaining —much of that being played out right now on Rush Limbaugh’s radio wind machine, the Sunday-gasbag talk shows and in the coatrooms of Capitol Hill. If the debate over the Affordable Care Act develops consistent with American history, what’s coming next will ultimately be the acceptance phase — a critical stage when affordable, aspirationally universal health care will become one of the real, functional and hopefully successful constants of life in a nation in transition. The long road of American progress is littered with navigable hazards — the condemnations and contrarian actions of those who don’t want us on that road in the first place. We’ve been here before, more than once. He authorized two railroad companies — the Union Pacific and the Central Pacific — to build the lines. And in March 1864, he issued an executive order “respecting the points of commencement of the Union Pacific railroad on the one hundredth degree of west longitude, and of the branch road from the western boundary of Iowa to the said one hundredth degree of longitude.” This set the easternmost point of what would become the first transcontinental railroad. He did it when the responsibilities already facing him as president — working to bind a nation torn apart by civil war amid the searing issue of slavery — would have been more than enough. Lincoln did it anyway, despite the opposition of northern lawmakers, who feared the south would use it to their military advantage. The result: Nothing less than the creation of the first infrastructure of modern America. With its completion in May 1869, by one estimate, coast-to-coast travel time dramatically dropped from five or six months to six days. 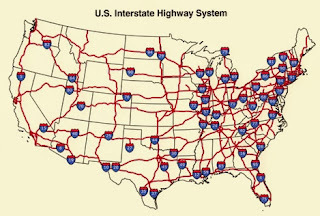 IN 1956, the Federal Aid Highway Act was enacted, authorizing the start of construction of what’s now called the Interstate Highway System. At a cost of $482 billion (adjusted for inflation in 2012 dollars), the project linked the country in much the same way the transcontinental railroad had done. 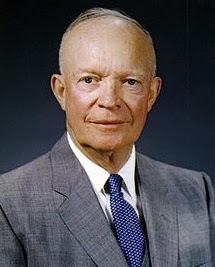 President Eisenhower passionately pursued the plan, partly inspired by his wartime travels on the German autobahn system. But Eisenhower was bitterly opposed by state governments, who objected to increase in gas taxes. “surprised residents of numerous inner-city neighborhoods with rapid and unprecedented changes it brought to the metropolitan landscape. Eminent domain empowered State Highway officials across the country to take control of and demolish residential properties for highway right-of-ways without requirements to provide replacement housing. Residents of inner-city neighborhoods with lower property valuations learned firsthand that state and local officials maximized federal funds by placing depressed multilane freeways, loops, and spurs through their neighborhoods to connect central business districts to the broader metropolitan community. Eisenhower went ahead anyway, despite the principled objections of state governments and the real pain caused to tens of thousands of families. 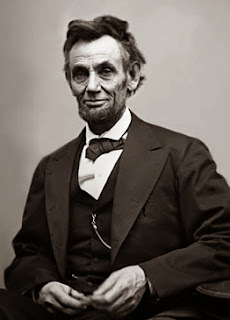 The result: the most expansive public works project in American history ultimately created millions of jobs, and completed the work of connecting the country that Lincoln had championed and enabled. 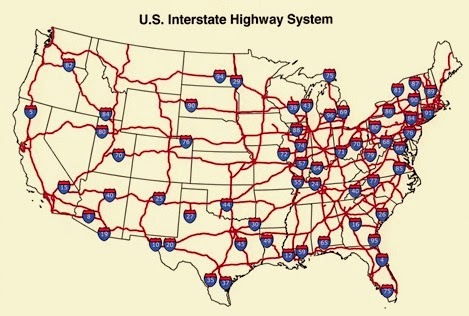 What had been a reasonably reliable patchwork of roads and regional highways was transformed into a central nervous system that shuttled American business, and the American people, into the future, and defined American efficiency to the world. Just try moving from one state to another without using one. It’s getting harder to remember when wearing seat belts behind the wheel wasn’t required by state governments across the country, back before New York State became the first in the nation, in December 1984, to make seat-belt use mandatory. Back when people complained bitterly about their personal rights being taken away ... back before the statistics came in proving that seat belt use saves lives. It’s almost impossible to remember how President Kennedy’s daring conceit — “of landing a man on the moon and returning him safely to the Earth” — surprised and confused scientists and enraged other Americans after he issued that momentous gauntlet throwdown in a joint session of Congress in May 1961. He knew what he was in for. “No single space project in this period will be more impressive to mankind, or more important for the long-range exploration of space; and none will be so difficult or expensive to accomplish,” he said that evening. Underline that part about “expensive to accomplish.” In 1966, NASA funding represented 4.4 percent of the federal budget, according to Space.com. 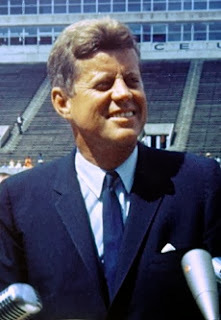 This was one of the economic reasons that, quiet as it’s been kept through 50-plus years of rose-colored technological reverie, there was more than sporadic opposition to the Kennedy space program. Now we're getting somewhere. Maybe. 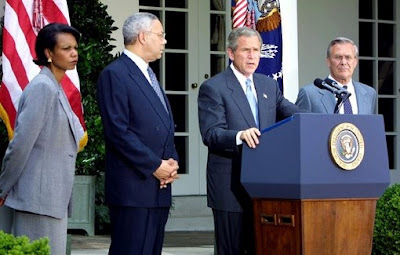 IF THE EVENTS of the last 36 hours or so, and the consequence of events that took place 12 years ago, have taught us anything, it’s that the United States may finally be older and wiser about how it gets into war. In a minute, everything’s changed on the Syria crisis – from the process of diplomacy to the prospect of military force – with Russia in the uncharacteristic position of carrying the diplomatic ball. In a minute the United States has stepped back from the edge of some kind of military intervention into a kind of twilight zone of diplomacy with the strangest of bedfellows. We’re on the brink of the brink now; where we go next may depend on what happens in Geneva. What began as an offhand remark made by Secretary of State John Kerry in London on Sept. 9 has taken on a life of its own. After meeting with British Foreign Secretary William Hague, Kerry was asked by a CBS News reporter what could possibly be done to avert military strikes on Syria? 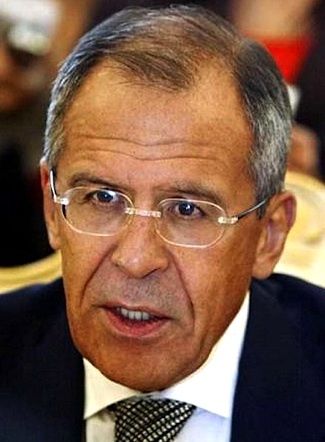 Be careful what you appear to wish for: Some time later, Russian Foreign Minister Sergei Lavrov got all over it, floating a proposal to put Syria's chemical stockpile under international control. 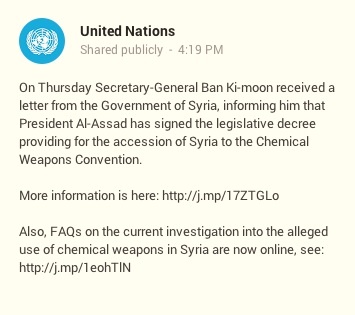 That initiative includes Syria become a signatory to the Chemical Weapons Convention, the global compact that bars the use of toxic and chemical agents in war. 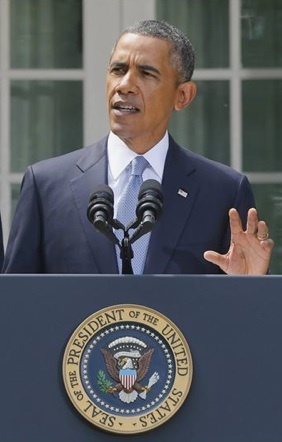 President Obama, forced into a reactive crouch by nothing more or less than the swiftness of events, addressed the nation on Tuesday, basically reiterating what he’d been saying: plans for a military strike against Syria were still in the works. But this was tweaked to accommodate mention of what he called “some encouraging signs” from the day before: the statements made by Lavrov and Muallem. “We must stop using the language of force and return to the path of civilized diplomatic and political settlement. Putin, acting in a marked departure from his KGB instincts, thus made his bid to take the high ground on the evolving Syria situation. 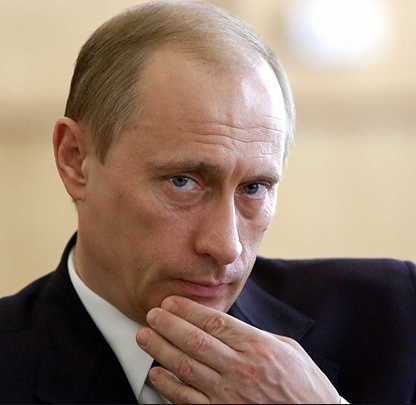 But for all his welcome pacifist intentions, we’re well advised not to put Putin up for the Nobel Peace Prize just yet. Russia clearly has much invested in Syria; by extension, it’s got a lot to lose if this deal goes south. This may be one time when Putin the spymaster yields the floor to Putin the statesman. It should be. The stakes are too high for Russia and Syria for this not to be a serious proposal; that fact puts the burden squarely on Putin and the Assad regime to deliver on what they’ve proposed. Muallem called the agreement something intended to “pull the rug from under the feet of American aggression.” That only works if the Russians and Syrians do what they said they’d do. ANY POSSIBLE deal to head off a military intervention appears to have the risk of falling apart over how the deal is implemented. There’s hand-wringing going on over how Syria’s various chemical weapons sites, scattered through a country about the size of Washington state, would be secured and their 1,000 tons of sulfur mustard gas, VX and sarin accounted for and destroyed. A lot of the concern suggests the job of doing this process would fall to the international monitors — led by the United Nations inspectors — sprinting around Syria to check on chem-weapon sites in the hot zones of the most dangerous active civil conflict on earth. But this is where we find out how serious the Russians and the Syrians really are. Because if the pledge of Syria to sign the Chemical Weapons Convention is to mean anything in operational terms, Syria and its broker Russia have to play an active role in securing and shutting down those chem-weapon sites. The first and obvious way of doing this is repurposing some of the Syrian armed forces, tasking them with a new and non-offensive responsibility, borne of a change in the geopolitical situation. The safest way of doing this, of course, is after the establishment of a cease-fire. 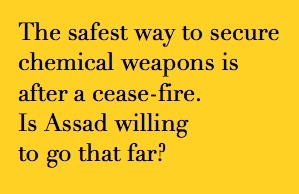 Is Assad willing to go that far? Is Putin willing to be the go-between who helps get this done? 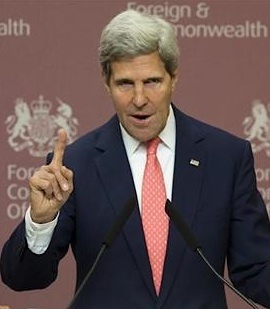 Kerry is meeting with Lavrov today in Geneva to hash this out. Over the last three days, we’ve been led to believe that Russia and Syria now wield some masterstroke of diplomatic courage. In Geneva, we may find out if they’re willing to hold their own feet to the very fire they started. All of this works to make the status of the United States Senate resolution something close to null and void. Oh, the president’s speech on Tuesday night held tight to the option of a military strike against Damascus. “It’s too early to tell whether this offer will succeed, and any agreement must verify that the Assad regime keeps its commitments,” Obama said. But the Russia-Syria gambit changes the situation. The United States may have used the threat of the use of force to get the Syrian regime to come this far, but now, ironically, the threat of force loses its leverage. With draft resolutions being debated at the UN, the Syrians apparently offering a full inventory of their CBW stockpiles, and the vote in Congress on the resolution pushed back for who knows how long, the resolution for the moment is, practically speaking, a dead issue. In the middle of conciliatory statements, diplomatic advances – and possible breakthroughs – a military strike, or even consideration of one, doesn’t make any sense. Right now, anyway. THERE’S a holistic way of looking at this, one that lawmakers and analysts have been painstakingly resisting, as they isolate the issue of chemical weapons from the wider matter of the Syrian civil war, which has killed perhaps as many as 120,000 people. On Wednesday, Rep. Chris Van Hollen (D-Md.) told The Hill that he and Rep. Gerry Connolly (D-Va.) intend to introduce their own fall-back version of a use-of-force resolution. Labels: Andrew Sullivan on Kerry, Kerry in Geneva, Short Sharp Shock., Syria chemical weapons, Syria on the brink of the brink, Syria-Russia gambit, who'll inspect Syria CBW sites? WHATEVER PIZZA business that’s got the White House and Congress on speed-dial probably had one hell of a great weekend. With the coming week likely to be a time of decision by the executive and legislative branches of our government on dealing with the situation in Syria, small businesses undoubtedly benefited from late nights in the West Wing, and elsewhere in the nation’s capital, these last few days. Busy-ness is job #1. White House chief of staff Denis McDonough got the ball rolling on Sunday, with appearances on five Sunday-morning news programs. 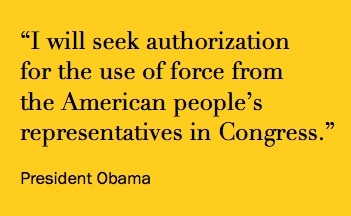 And President Obama isn’t outsourcing any of his own heavy lifting. The president will appear in interviews with six broadcast and cable news outlets today. Reuters reported Saturday that Obama will huddle with the anchors of ABC News, CBS News and NBC News, as well as the anchors for CNN, Fox News and PBS. “The interviews will be taped on Monday afternoon and will air during each network's Monday evening news broadcast,” Reuters reported from a White House statement. This, of course, comes before the president’s planned address to the nation, set for Tuesday in prime time. Given the president’s love of basketball, the only thing to call it is a “full court press”; that’s the phrase being used in various news stories already. But while that’s true to a point, it’s another kind of game. 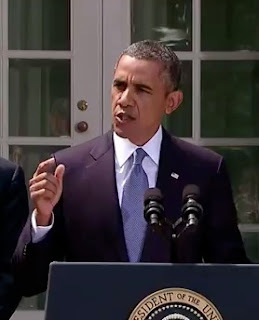 Despite the flurry of interviews planned for today, a savvy use of the office’s bully pulpit, Obama’s playing a full court press without the ball. Which is very much in Congress’ court right now. The uncertain fate of the resolution soon to be debated by the full Senate complicates whatever the president’s message will be today and Tuesday. This will be his best, most unalloyed opportunity to make his case for a military intervention — even as doubts about the source of the Aug. 21 gas attacks continue to swirl, and, importantly, as the Obama White House undercuts the authority of its own narrative by failing to release intelligence information that could dramatically buttress its case. Like with the Syrian conflict itself, the risks of inaction by the White House — failing to correct the absence of corroborative details in the public record — are considerable. The administration’s penchant for secrecy and containment could well undo the hammer-and-tongs work on the Syrian question now underway in the White House. REPORTS HAVE surfaced that suggest the certainty of the source of the gas attacks may be less than certain. One example: Citing German intelligence, Germany's Bild am Sonntag paper reported Sunday that one of the chemical attacks believed to be carried out by the Syrian government may have been done without the personal approval of President Bashar al-Assad. Even if that’s true, from the standpoint of culpability, this would amount to being a distinction without a difference. An officer in the Syrian armed forces is very much a functionary of the Assad regime. And if it is true – if a lower-echelon maverick in the Syrian military has both the access to chemical weapons and the ability to use them without approval from the Syrian government– Assad may be weaker and less in control of his country than we thought. Another distinction without a difference may be the incidental one created by the Obama administration in advertising the proposed military strike as “limited,” “targeted,” “narrow” (among other such presumably surgical modifiers) and in stating that the strikes aren’t intended to hasten Assad’s ouster from power — as though the one wouldn’t affect the other. This attempt at anodyne, calm-the-waters language obscures the moral narrative behind a proposed strike, and it complicates the message to the public. 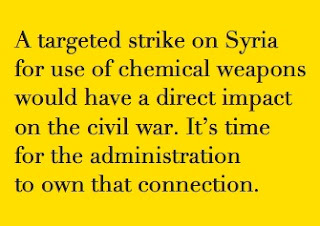 At the end of the day, a targeted strike on Syria for use of chemical weapons would have a direct impact on the civil war; the two are joined at the hip; the one would have an effect on the other. It’s time for the Obama administration to own that connection. 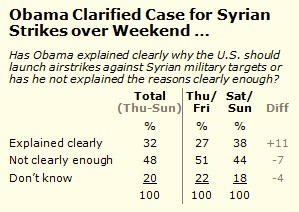 But the biggest challenge to Obama’s strike plans may be the administration itself. Reuters reported on Sunday about how the White House is withholding some of the very intelligence the American public needs to know in order to give the president the support he needs to have. From Reuters: “The Obama administration, searching for support from a divided Congress and skeptical world leaders, says its own assessment is based mainly on satellite and signals intelligence, including intercepted communications and satellite images indicating that in the three days prior to the attack that the regime was preparing to use poisonous gas. IT’S MADDENING little disconnects like that — disjunctures between what the White House says it wants and what the White House is prepared to do on its own behalf to get what it wants — which have the piranhas in the media ready for dinner. But if the resolution fails and the president walks away, it won’t be so easy to dismiss his previous (and thoroughly correct) call to action on Syria as a moral imperative for the world, and nothing less than a vote on the kind of world we want to live in. You can’t just walk back a statement of moral principle like it’s a talking point, and rest assured, the president wouldn’t even try. So what options would be left? If he felt deeply enough about it, if his convictions as previously delivered were strong enough, the president’s last recourse would be an appeal to the United Nations General Assembly. But that would isolate the president from Congress even more, and would send absolutely the wrong signal to the American people about his confidence in the American government he leads. Few things would make realizing his second-term domestic agenda more precarious than that. SOME HAVE rushed to the general conclusion that if the Senate approves the resolution, a strike would be more or less imminent from that moment — that cruise missiles would be inbound from the second the deciding senator says “aye.” That’s likely to be wrong. Nothing in the resolution obligates Obama to act immediately; waiting for the United Nations chemical weapons inspectors to complete their work wouldn’t in and of itself be an obstacle to a strike against Syria. There may be no need to wait on the UN at all. The German weekly Frankfurter Allgemeine Sonntagszeitung reported on Saturday that the inspectors “could submit initial findings from its tests of samples collected in Syria by the end of next week.” The paper’s report was circulated widely by other news outlets. In some ways, time is on President Obama’s side. 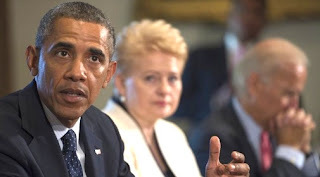 Whether the resolution is agreed to by the Senate or rejected, as various Beltway seers now predict, Obama would have time to build a diplomatic and military coalition that accurately reflects the international concern this ought to be. Ironically enough, if it’s rejected, the president will be compelled to step away from the prospect of swift action and go back to doing what he’s become known for, for the entirety of his administration: deliberating, considering, thinking things through. Whether that would change the White House calculus for military action is anyone’s guess. In any case, the Obama administration has cards it’s not showing right now, and Americans want to know what they are. 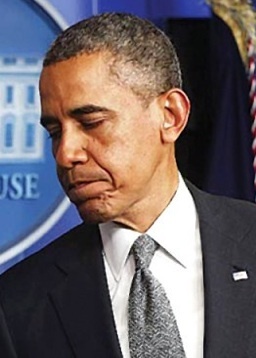 That partly explains some of the president’s most recent poll numbers on Syrian intervention; a Sept. 4 Pew Research Center poll found that 48 percent of Americans feel the president hasn’t laid out his case for a strike clearly enough. That may be another way of expressing a sense of foreboding about what could be coming. It won’t be easily dismissed, and it won’t be affected at all if the president doesn’t lay it all out tomorrow and Tuesday. Emphasis on all. Every American president has one: the single clarifying, crucible crisis that lays bare his strengths and weaknesses; the event or series of events that thoroughly distills the essence of an administration; the pivot point whose momentousness is both immediately apparent and historically resonant. President Obama may have his very own in the next 72 hours. Image credits: Obama and Biden, Rose Garden: The Associated Press. Assad and generals: The Associated Press. Harman: via Raw Story.com. 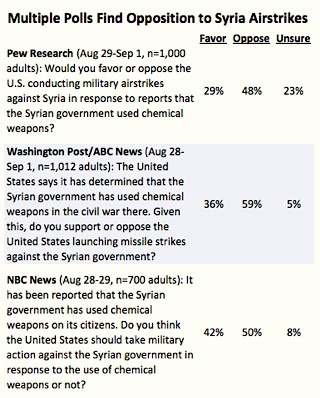 Pew Syria poll snapshot: © 2013 Pew Research Center. ON WEDNESDAY, the Senate Foreign Relations Committee approved, 10-7, the White House draft resolution on a military strike against Syria for suspected use of chemical weapons. The Senate resolution limits U.S. military intervention there to a maximum of 90 days, and bars the use of ground troops. The full Senate votes on the resolution next week; The Daily Beast reported that Senate Majority Leader Harry Reid could bring the resolution to the Senate floor as soon as Monday, with a full vote possible by Wednesday. 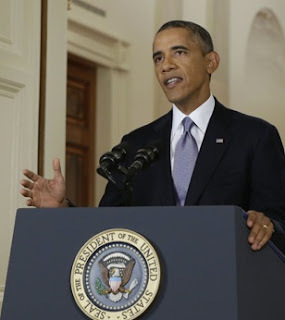 Until then, President Obama has his work cut out for him as he tries to persuade a balky Congress and a war-weary American public that a military intervention in Syria is both a strategic necessity and a moral imperative. To that end, with plain speaking at his disposal, the president really needs to build two coalitions. The first one, among those Democrats, Republicans and independents, is the immediate domestic challenge, and one he’s been working on in his own low-key way. The second coalition is just as important, and maybe more so: President Obama needs to try to build a consensus with chin-pulling NATO countries, and, especially, the various Gulf states bordering and neighboring Syria — the nations with more at risk that they may be willing to admit. The White House power-pointed presentation started on Tuesday, with Secretary of State John Kerry appearing at the first Syrian-attack hearing of the Senate Foreign Relations Committee. THE PROBLEM with such thinking is that it compartmentalizes something that doesn’t respect compartments. The use of chemical weapons isn’t a water’s-edge issue, if it ever was. The prospect of chemical weapons doesn’t answer to the convenience of borders and geography. The portability of such weapons, their ease of use and their low cost (certainly relative to other, more sophisticated arsenals) are malign force multipliers for any outlier state — or, frighteningly, any non-state terrorist element anywhere in the Middle East or the world at large — to make use of. At a time of their choosing. Some in the current debate have tried to juxtapose the disaster of the Iraq experience and the ongoing tragedy in Syria. But the bogus premises and faulty intelligence that preceded the United States’ quagmire in Iraq aren’t in evidence now. Unless the United Nations inspectors reveal that the Aug. 21 gas attacks were a complete fiction, there’s plenty of intel available. We have the dispositive intelligence proving the fact of the crime alleged. No hypothetical aluminum tubes or yellowcake uranium this time. The evidence is there, videotaped and observed by various humanitarian organizations and the world’s media: the bodies of 1,429 people — 426 of them children – in locations within Syria that were held or contested by the rebel forces. We went into Iraq looking for weapons of mass destruction. We don’t have to go into Syria to know that weapons of mass destruction exist. There are at least 1,429 mute witnesses attesting to that. THIS ISN’T some hysterical, forehead-vein-popping cry for American invasion. It’s recognition that, first, Syria’s almost-certain chemical aggression demands an answer in military terms; second, it’s a recognition that that answer needn’t, and shouldn’t, come from one country in the world. Qatar’s French-made Dassault Mirage fighters enforced the no-fly zone over Libya in 2011; with regional stability more at stake now than in 2011, the Qataris might be persuaded to perform a similar operational role over Syria, with flying time between Doha and Damascus shorter than that required to get into Libyan airspace two years ago. Jordan, which borders Syria, has about 110,000 active-duty military; its armed forces are provisioned by a number of foreign suppliers including the United States; its air force boasts considerable offensive, transport and reconnaissance aircraft made by American manufacturers. Turkey, which also borders Syria, has about 500,000 active-duty personnel, and more than 1 million if reserves are counted. Not to mention an air force well supplied with refueling tankers, satellites and indigenous drone technology. Saudi Arabia, a long-time ally of the United States, claims at least 650,000 active-duty personnel and an air force that is, thanks largely to American military foreign aid, the most powerful moderate Arab military force in the region. There are others, of course – Oman, the United Arab Emirates, Bahrain, Kuwait – but the point’s made. 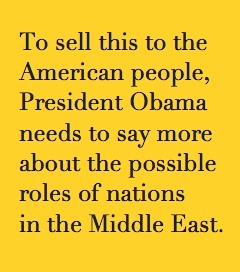 To sell this to the American people, President Obama needs to say more about the possible roles of Middle Eastern nations in the military intervention, the ones with the most to gain, and to lose. Just because those countries can’t do everything, militarily speaking, is no justification for them being expected to do little or nothing. A regional problem – and that’s what this is right now, or soon will be – demands an equal regional response. Everyone’s got to get it up on this one. THE HANDICAPPING’S already started on the odds for success or failure of the Senate resolution. If the resolution goes down to defeat next week, with both Democrats and Republicans crowing about it each for their own separate reasons, it might look in the short-term like a defeat, if not a flat-out humiliation, for President Obama – and (geopolitically) the United States itself. Walsh was referring to how the president had taken a situation with few if any good options and made a way out of no way. With the mainstream media and much of official Washington convinced that the United States was on its way to another foreign war, with the president set to unilaterally order a military strike on the regime of Syrian President Bashar al-Assad, Obama changed course on Saturday, opting instead to seek congressional approval of the contemplated “limited, narrow” attack on Syrian military targets. 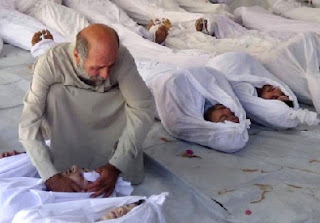 With one deft move, Obama changed the game on planned actions against the Assad regime, which the White House blames for the Aug. 21 gas attacks in Syria, in which more than 1,400 people died, including 426 children, in a chemical assault on a wide range of Syrian towns. By choosing to go through congressional channels consistent with the War Powers Act of 1973, the president resists being saddled with the cowboy meme established by George W. Bush during the two wars of his administration’s creation. The president’s gambit also ushers in the domestic side of the greatest crisis of the Obama second term, a potential farrago whose resolution will dominate the White House second-term agenda from now to the end of the year. “Our military has positioned assets in the region. The Chairman of the Joint Chiefs has informed me that we are prepared to strike whenever we choose. Moreover, the Chairman has indicated to me that our capacity to execute this mission is not time-sensitive; it will be effective tomorrow, or next week, or one month from now. And I’m prepared to give that order. BUT HAVING made my decision as Commander-in-Chief based on what I am convinced is our national security interests, I’m also mindful that I’m the President of the world’s oldest constitutional democracy. I’ve long believed that our power is rooted not just in our military might, but in our example as a government of the people, by the people, and for the people. “I know that the country will be stronger if we take this course and our actions will be even more effective,” he said, adding that he’d contacted the majority and minority leaders in the Senate and the House. 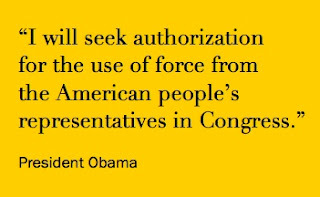 Later in the day, the White House forwarded to Congress a draft of a resolution, authorizing the president to use military force. It’s sure to be Action Item #1 when Congress comes back in session on Sept. 9. The president, along with Secretary of State John Kerry (in the role of deputy hawk) were prepared to act on what it said was corroborative information, including that in an NBC News report that said the United States had intercepted an internal Syrian government communication that indicated it was Assad’s brother, a commander of the Syrian Republican Guard, who personally authorized the Aug. 21 attacks. NOW, THOUGH, the ball is thrown into the court of a Congress well-known for its willingness to oppose Obama on everything but what he orders for lunch. For Republicans and conservatives who’ve long hoped to regain their reputation as American hawks ever-bullish on defense — the same people in Congress who’ve opposed the president by reflex since he first took office – Obama’s prudent U-turn puts them in the position of looking soft on national security if they vote no, and (anathema to most of them) supporting the president on a big issue if they vote yes. The Congress we’ve come to know, a body enamored of willful gridlock, can probably be expected to drag its feet even after they reconvene on Sept. 9, but Obama’s remand of the issue to Congress means he’s already committed to the idea of taking his time on dealing with Syria – a line of thought consistent with his cerebral, painstaking style of decision-making.